For some reason, whenever I think of Faiz Ahmed Faiz, I think of poets like Pablo Neruda and Octavio Paz, which is not fair because Faiz was neither a South American poet nor were Neruda or Paz poets of exile like Faiz. God knows what led me to forge this image of Faiz in my mind because in 1984, when he passed away, I was still a child, and I might have seen the pictures of this celebrated poet in Urdu literary journals that were still alive and kicking in India at that time. When I think hard about that image now, it dawns on me that I might have gathered this impression of Faiz because I remembered him as a cultural ambassador from the Indian sub-continent – Zulfikar Ali Bhutto had appointed Faiz to the National Council of the Arts after his incarceration had ended. Later on, he had also won the Lenin Peace Prize in 1963 for his poems that had been translated into Russian. Besides that image of him as a cultural diplomat from Asia, a kind of a globalized figure, I remember Faiz as a poet of love and a poet of protest. In him, I see a lover who is also a revolutionary, a big-nosed man with a hard Punjabi face and smiling eyes, surrounded by curls of cigarette smoke, worrying about the injustices of the world, injustices that come in the way of a lover – rubbish that must be cleared away from the path of love. While I was supposed to write this piece, I was incidentally reading Edward Said’s Reflections on Exile and Other Essays (Cambridge, MA: Harvard University Press, 2000). I was surprised to find Faiz mentioned in the title essay. “How was it possible?” I asked myself. But it was there like a little miracle. This was the last phase of Faiz’s life – his life as an exile (his exile ended in 1982 and soon after he passed away in 1984). Before that, he had been many things, worn many hats – he had been a teacher, a military man, and also a journalist. But above all, he was a poet – a creator of art in a civilization of quasi-barbarism, in the words of George Steiner. What strikes me about Faiz is that his origins and educational background were very similar to that of Allama Muhammad Iqbal’s (a lawyer by profession and a friend of Faiz’s father, Sultan Muhammad Khan), the greatest Urdu poet after Ghalib. Both were born in Sialkot, both got educated in colleges in Lahore, both studied Arabic and Persian (though Iqbal’s main subject was philosophy) and both taught for a while before moving into other domains of profession – Iqbal into full-time practice of law and Faiz into the British Indian army. Iqbal revered Ghalib as a master poet, yet it was Faiz, not Iqbal, who came closest to composing poetry in Ghalib’s style of classicism, and became the last greatest poet of Urdu. Iqbal was a revolutionary poet, too, but his commitment to inspire the Muslim community became his main focus. Faiz, a man who saw India’s Independence that came with the horror of Partition and that brought power to the elites but the misery of the poor and the dispossessed continued, tackled themes of socialism and class struggle, after the initial phase of composing romantic poetry. There are many facets of Faiz’s poetry but what fascinates me is this dichotomy between a lover and revolutionary that he so beautifully captures in his poetry. Because of his poetic genius, like Ghalib and Iqbal before him, the lovers of Urdu poetry too will always remember Faiz. And personally, I will keep humming his couplets while imagining his face amidst the rising curls of cigarette smoke that create a halo-like effect in many of his portraits. His poetry will always keep tugging at my heartstrings with all the might of its sweet sorrow. 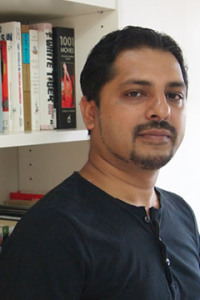 Zafar Anjum (www.zafaranjum.com) is a Singapore-based journalist and writer. He is the author of Iqbal: The Life of a Poet, Philosopher and Politician (Random House, 2014). He edits a literary website, Kitaab.org. Indeed, Ghalib, Iqbal and Faiz form a kind of trinity in Urdu poetry. Besides the similarity in some of the concerns and responses, all three can be considered to be in the “high” tradition of Urdu poetry with its usage of Persian vocabulary in contrast of the “little” or “low” tradition of Kabir, Mir and Ibne Insha that uses more of Hindi words and shorter behr in the couplets. Iqbal forms a crucial link between Ghalib and Faiz. He is both a late Ghalib and an early Faiz. Faiz is time bound plain verse . Without much philosophical depth. A mere political diatribe in verse. To elevate him to Ghalib is travesty and khulwar with Urdy poetry. Faiz has a message for the Marcist youth nothing more, after all hexes the KGB station chief in Pakistan. His nexus was with Sheikh Abdullah-Nehru-Khan-AG-Khan of Sarhad. An untrustworthy troika of Muslns that crook intellectual oxygen from Nehru’s political ideas.